A monumental contribution to natural history, this work is commonly recognized as the first published work to provide illustrations and descriptions of North American flora and fauna. 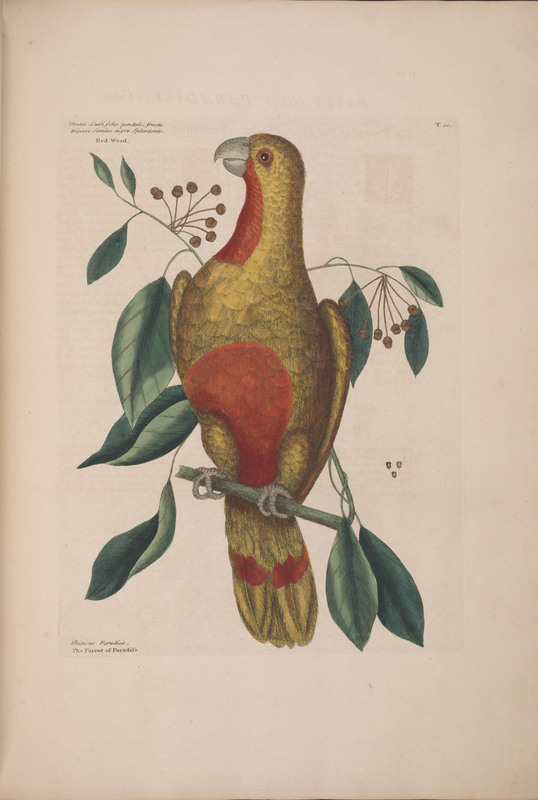 In particular, Catesby’s colorful illustrations of American birds stand out for their setting amidst nature, predating Audubon’s similar bird illustrations by nearly a century. During his four year long trip to America, sponsored by Royal Society members, Catesby sent a wide variety of specimens back to England. One such recipient of American biological specimens was the naturalist Sir Hans Sloane, whose work is also on display in this exhibit. After his return to England in 1726, Catesby would work on the publication of this work for the next twenty-one years, with the final part being published in 1747. The Natural History of Carolina, Florida and the Bahama Islands: Containing the Figures of Birds, Beasts, Fishes, Serpents, Insects, and Plants: Particularly the Forest-Trees, Shrubs, and Other Plants, Not Hitherto Described, or Very Incorrectly Figured by Authors. London: Printed at the expence of the author, 1731-43.